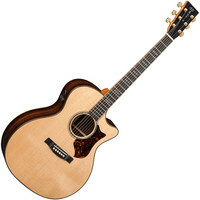 The Martin GPCPA1 Plus Guitar is one of the electro acoustic flagship models of the Performing Artist Series combining modern design and innovative techniques with those introduced by the company founder. The GPCPA1 Plus electro acoustic guitar has solid East Indian Rosewood back and sides that are paired with a solid Sitka Spruce top helping to produce the legendary Martin tonality with exceptionally sweet overtones. Integrating state-of-the art Fishman F1 Aura+ electronics with stunning aesthetic features and a comfortable playing experience the GPCPA1 Plus is the perfect all round guitar.